Above, the building that housed the Haskell Exchange of Southwestern Telegraph and Telephone (the company which later became Southwestern Bell Telephone and, eventually, part of AT&T), located at the southeast corner of Bryan and Haskell in Old East Dallas. It was so cute and quaint back in 1910 (the year this postcard was mailed). AT&T still has a building on this very same corner — over a century later. Unfortunately, the building stopped being quaint a long time ago. See the same location today, here. Some awnings might help…. 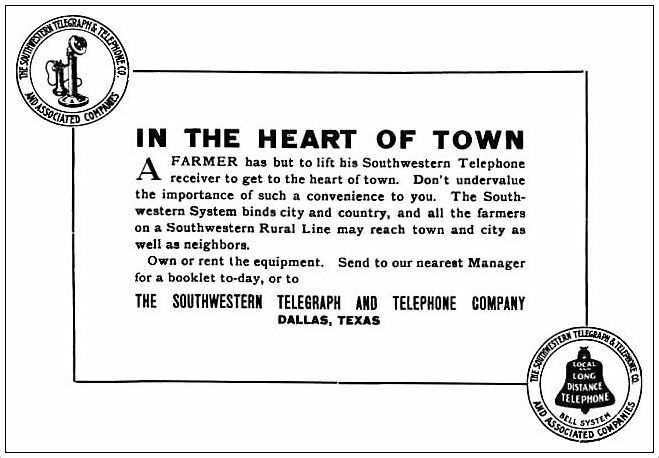 More about the operators of Southwestern Tel. & Tel. 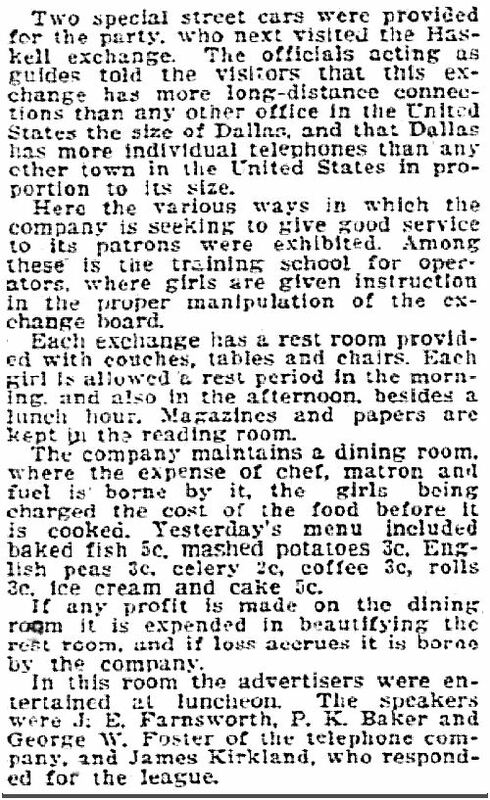 (with photos of their “rest room”) can be found in the Flashback Dallas post “Work and Play in Telephone Land,” here. In this case “exchange” did not mean the same thing as telephone exchanges such as “Taylor,” “Emerson,” “Lakeside,” “Fleetwood,” “Riverside,” etc. Read more at Wikipedia here and here for the distinctions. Very interesting post Paula! My dad worked for Southwestern Bell for 33 years after the end of WWII. A good part of that time was spent at the Haskell Exchange. Thanks for the story. The Haskell Exchange was a building housing the workings of a branch of the telephone company (switchboards, circuitry, etc.) as well as general offices. Switchboard operators, technicians, and various other telephone company employees worked there. …I think. 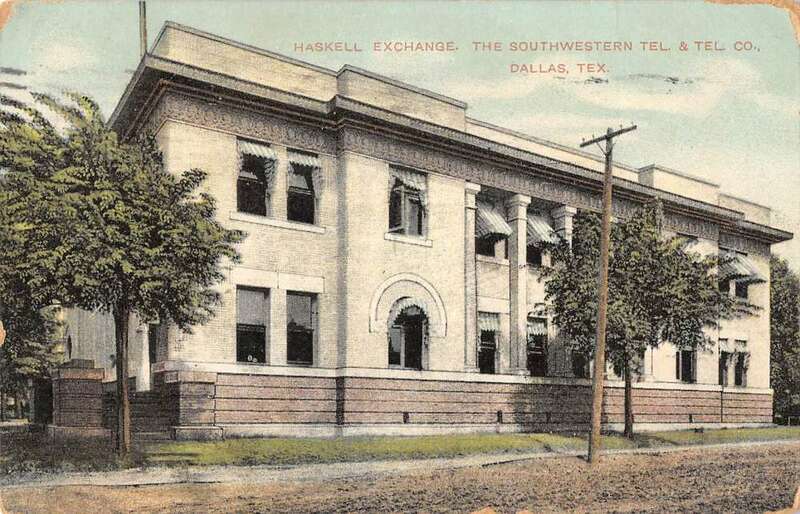 It is not the same as the telephone exchanges such as “Taylor,” “Emerson,” and “Lakeside.” (Although, as it was on the edge of East Dallas, the Haskell Exchange building was in the Taylor exchange. I meant to add Wikipedia links to these distinctions. I’ll do that now!